Music is the life and soul of people these days. Gone are the days of a radio when you would just turn it on and listen to whatever songs that were played. Now you have the ability to download all the songs you like and create your own playlists. The main difference between a radio and your own playlists is that on a radio you will not be able to choose a genre, or have your own playlist. To counter this, several applications were released that would let you select your genres, but even then you don’t get to choose your own songs. Songza is an application that will let you do all of that on a whole new level. Once you install Songza, it will ask you to connect to your social networks. Of course it is up to you whether you connect or not but once that step is completed, the magic happens. Songza will suggest list of different activities that you could be doing based on the time of day and the day itself. For example, a popular routine thing to do during the day on a Saturday would probably be doing some chores or spending time with your family or driving and even relaxing. Based on the time of day on that particular day, you will be provided with different activities that you could possibly be doing. 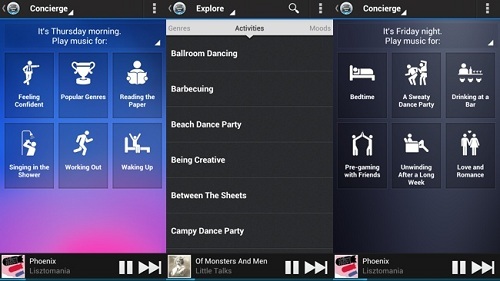 Once you pick one of these activities, Songza will then provide you with a list of genres. These genres will most likely correspond with you would be doing at that time. You pick a genre and you will be provided with three different playlists. Choose one of them and you are good to go. Put your headphones on and let Songza play songs for you. You can pause a track and even skip it, you can give it a thumbs up or down and that will let Songza learn your taste in music to further customize your playlists for further use. You can even make a manual selection of playlists based on genres, activities, moods, decades and culture. The application is extremely easy to use and is pretty good at what it does. The developers have been very comprehensive with it too for example, if you create a manual playlist based on an activity that you’re doing, the list for activities includes ballroom dancing, barbecuing, being creative, breaking up, city cruising, casual dinner party and loads more. All in all, it’s worth giving this application a shot.